EDMONTON, AB – The Fall 2018 issue of the Alberta Craft Beer Guide, a quarterly publication covering the craft brewing scene in the westernmost prairie province, is being released this weekend. 84 Alberta Brewery profiles including eight new entries. An improved brewery maps section, including new maps for Central, North, and South Alberta. A “Soon-eries & Rumour-ies” section listing breweries in planning or under construction. Feature articles including “Badass Women of Yester-beer”, the 2nd part in a series on the history of women in beer, and “Words Over Stars”, a look at importance of descriptive reviews of beer versus just a numbered review. Launch parties for the new issue will be taking place at Prairie Dog Brewing in Calgary on Tuesday September 11th at 6:30 PM, and Alley Kat Brewing in Edmonton on Thursday September 13th at 4:00 PM. 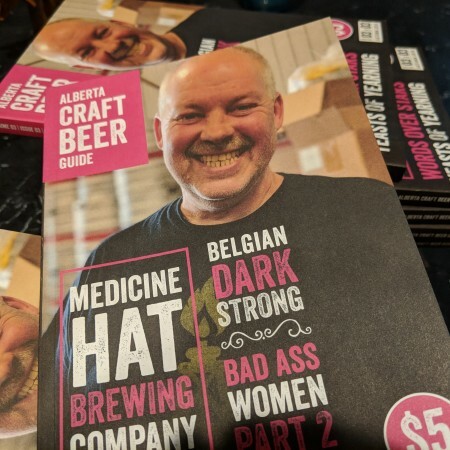 The Alberta Craft Beer Guide is available at breweries, liquor stores, bars and beer events throughout Alberta, and via subscription on the magazine’s website. For more information including further details on the launch events, see the magazine’s Twitter feed and Instagram account.